Rhubarb is a classic allotment and garden vegetable favourite. They are one of the easiest yet most rewarding varieties to grow and very high yields can be achieved. 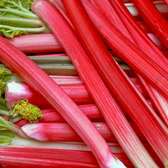 The flavour of Rhubarb is outstanding and is great for cooking purposes, superb for tarts, pies or homemade ice-cream. Top quality Rhubarb crowns supplied.